The Canon IVY CLIQ+ is the small and fun Instant Camera and Mini Photo Printer that can fit in your pocket so you can take it anywhere! The IVY CLIQ+ features a large 2" Selfie Mirror with an 8 LED ring light for great looking selfies! Easily connect your mobile device to the Canon Mini Print app via Bluetooth1 and take a photo with your mobile device's camera or choose one of your own photos. Even use fun AR filters and add effects, frames, text, and stickers to your 2"x3" photos to print and stick! What is ZINK™ and how does it work? ZINK™ stands for "ZERO INK" printing technology. Instead of ink, it uses colorful dye-based crystals embedded inside the paper. Before printing, the embedded dye crystals are clear so ZINK™ Paper looks like regular, white photo paper. The ZINK-enabled device uses heat to activate and colorize these crystals. 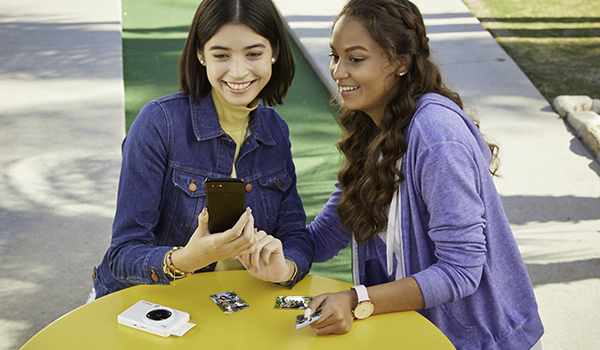 With the IVY CLIQ+ it's easy to shoot and print photos so you can capture memories, share them instantly, and even stick them thanks to the photo's sticker back. The IVY CLIQ+ has an 8 MP camera, a ring light and a selfie mirror so you can easily get the perfect shot to shoot + print + stick. Group shot? No problem! You can also instantly print more as for friends needed with the reprint button. Shoot + print photos while getting creative with the free Mini Print app and fun filters, effects! If you choose to take your photo on your mobile device, you can print it directly to your CLIQ+! Easily add effects, filters, stickers and more thanks to the Canon Mini Print app and Bluetooth connectivity1 - you can get creative and personalize every moment!1 The Mini Print app even has fun AR filters and face distortion so you can have even more laughs and fun plus a remote shutter so if you choose to shoot your photo directly on your CLIQ+ you can never miss the chance to be in the shot! 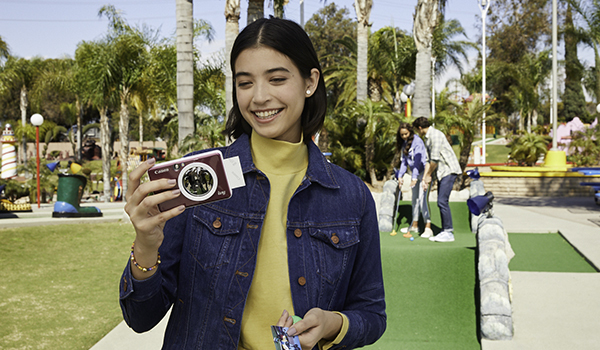 With the Canon IVY CLIQ+ Instant Camera Printer + App, now you have a camera and a printer - all about the size of a smartphone, small enough to fit your pocket and ready to take with you. You can bring your memories to life with instant prints to stick or share on social media! Plus its available in three dazzling colors - Pearl White, Sapphire Blue, and Ruby Red so you can choose which one best fits your style and personality! 2 Packs of ZINK™ Photo Paper. Each Paper Pack has 10 Sheets and 1 SMART SHEET™. 5 Packs of ZINK™ Photo Paper. Each Paper Pack has 10 Sheets and 1 SMART SHEET™. Requires mobile device to be connected to the Canon IVY Mini Photo Printer via Bluetooth® and the Canon Mini Print App, available for free on the App Store and at Google Play. Compatible with mobile devices running iOS 9.0 or later, and Android devices running Android 4.4 or later. Mass Storage Mode is available when using a supported microSD card that is installed and formatted and while using the included USB 2.0 cable and a compatible desktop operating system. Compatible desktop operating systems include Windows 10, 8.1, 8 or 7 and Mac OS X v10.10 - Mac OS 10.14. Warranty programs are subject to certain conditions and restrictions. For customers in the United States, visit www.usa.canon.com/support for more details, for customers in Canada, visit www.canon.ca/support for more details.